This mantra and the Kaarika on the Upanishad authored by Gaudapaadachaarya offers a sequential method of understanding Vedanta. This came up in a discussion with a friend and I am penning this down. This post is based on my listening live to lectures on Vedanta given by own teachers and mp3 audio lectures by Swami Paramarthananda. Any errors here are due to limitations in my understanding. This is just for my record mostly and to share with those to whom it may be of interest. That a live Guru is needed to understand Vedanta goes without saying. In Step 1 of understanding Advaita, the seeker is led from a participant-observer in the world to a non-participating witness Saakshi. The word “world” now is defined as all that is witnessed, right from the physical universe, to the mental universe of thoughts and dreams, and as also the minds and bodies of oneself and others too. The seer of this world, is the Saakshi Atma who is not part of this world but merely its witness, devoid of properties and the ultimate subject. Thus now there are only two things that can be considered for further analysis – the first is the witnessed world consisting of all body-minds and other objects; the second is the Saakshi Atma. We now look at the next step. The world which is witnessed, including the body-mind complex, gets its substantiality from the Witness Consciousness alone. The borrowed existence, or the dependent existence, in Sanskrit is called Mithya. The Sakshi Atma is Satyam, independently real. The Mandukya Karika (the 2nd prakaranam of the 4th) however shows this in two sub-steps. The rest of this post will concentrate on Step 2(a): Waking world is not fundamentally different from dream-world. The Kaarika along with Shankaracharya’s Bhaashyam (commentary) show that there is no fundamental difference whatsoever of the waking-world (jaagrat prapancha) with the dream-world (swapna-prapancha). The waking-world is the world, along with the body-mind, as witnessed by the Sakshi Atman during the waking state (of the mind). This Jagrat prapancha is routinely taken to be ‘more real’ than the swapna prapancha, the world experienced during the dreaming state (of the mind). This is because the person generally experiences many different things during the dream-state which gets sublated, which are overridden, in the waking state. The nature of the waking state definitely appears far more real than the dream state in terms of its lasting nature or persistence, as also the orderliness in which things happen in the waking state when compared to haphazard dream states where anything seems to happen. 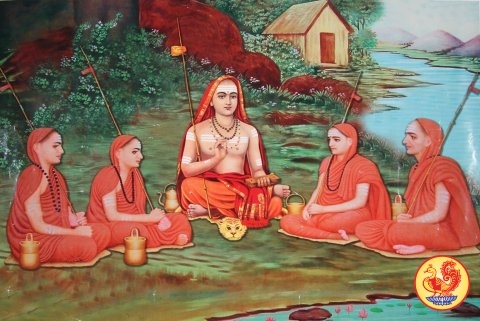 The Mandukya Upanishad Karika however does an elaborate analysis of these two states and concludes that though they appear to have different orders of reality to the normal person, when we probe deep into the nature of the jagrat and swapna prapanchas they share several common characteristics by which we can never conclude that one is more real than another. Succinctly put, the Mandukya Karika and the Bhagavatpaada Shankaraachaarya’s Bhaashyam (commentary) to the Kaarika rely on two central criteria to show the equivalence between the swapna prapancha and jaagrat prapancha. The two criteria are (1) Drshyatvam – The status of being a ‘seen’ entity, and, (2) Anityatvam : The status of being temporal. Both the dream and the waking world are equal as mithya (a reality which is dependent on, borrowed from, the Saakshi Atma). The argument for this claim is that any observed object can prove its existence only when it is observed, otherwise we cannot prove its existence. Suppose there is an hypothetical object X which can never be experienced by anyone at anytime, we can never accept the existence of that object. Existence of any object requires the experiencer. Saakshi Atma is the basis on which the cognition of any object is based, and the cognition of any object is inseparable from its existence. Therefore – jaagrat prapanchah mithya, drsyatvaat, swapna prapanchavat – the waking-world is dependent reality just like the dream-world on account of its being a ‘seen’-thing, an object that is witnessed, to prove which we need the witness Saakshi Atma. Thus the jaagrat prapancha, just like swapna prapancha, is also mithya, on account of its needing the Saakshi Atma to prove its existence. The idea is that anything which has a temporary existence cannot be taken as really existing at all. For example, the verse considers a mirage of a water body appearing in the desert. The mirage is only appearing for a short period of time, during which there are certain conditions leading to that appearance. Before the manifestation of these conditions there mirage is not there, there is only the desert sand which is seen as it is. Similarly after the disappearance of these conditions also the mirage is not there. The mirage therefore exists purely temporally. It is therefore only appearing to exist, while the real existence pertains to that which exists at all times. Another example may also be appropriate. Suppose we think of a vessel containing hot water. The heat which is now present in the water is temporary. It is gained by placing the vessel on some other source of heat (for example, fire), and it will soon be lost as the water cools. Therefore the heat is not inherently present in the water. This borrowed existence of the heat in the water itself means that heat is inherently absent in water.In the same way, all things exist only temporally. They are manifested, they come into existence at a certain point in time, and disappear from existence, become unmanifest at a later point in time. Thus, no thing has an existence of its own, for temporality is indicative of borrowed existence alone. This borrowed existence, this dependent existence is known as Mithya. Both the Swapna-prapancha and the Jaagrat Prapancha share the nature of being temporally existing. This is because swapna prapancha (dream-world) exists only during swapna-avastha (dream state), while the jaagrat prapancha (waking world) exists only during jaagrat avastha (waking state). Nobody can prove the existence of swapna prapancha when one is not in swapna, or the existence of jaagrat prapancha when one is not in jaagrat avastha.Several further doubts/questions that can potentially arise in our minds are taken up by the Karika and the Bhaashya regarding the equation between Jaagrat and Swapna prapancha and clarified. We will look at many of them here. Q1: Even if I am asleep, Jaagrat prapancha is there to others, Therefore how can we say it is only temporal? A1: It is because the others are awake while you are asleep. Jaagrat prapancha is available only to those who are awake. It is not available to any sleeping person. As long as you are asleep Jaagrat cannot be said to be existing by you. The idea that there is a jaagrat prapancha is known only after waking up. Thus both jaagrat and swapna prapancha are only temporarily available in their respective avasthas. Therefore they are mithya, they have only borrowed, dependent existence. Q2: You say that Jaagrat prapancha is mithya, it is not independently real but only temporal and has only dependent/borrowed reality. But I am experiencing this as real alone. A2: Even Swapna Prapancha appears real in the Swapna avastha. If in the dream, there is a dog which is chasing you the dreamed individual, then you have to run away from that dog if you don’t want to get bitten. You the dreamed individual, the dog, the running, they are all real in the dream, in swapna avastha. Only when you come out of the dream, out of the swapna avastha, that the swapna prapancha is recognised as mithya. Thus, you who are awake now in the jaagrat avastha, experience the jaagrat prapancha as real. However Jaagrat prapancha is still mithya, it has a borrowed existence, its existence is borrowed from the Saakshi Atma. Q3: I can accept that swapna prapancha is indeed not real because the objects present in swapna avastha are not useful in any way to use. Only the jaagrat prapancha objects have utility of various kinds. Only they can be used to satisfy our desires and remove hurdles. Therefore jaagrat prapancha is satyam. A3: It is true that the jaagrat prapancha objects have utility. But their utility is restricted to the jaagrat avastha itself. For example, if there is any person who is hungry in Jaagrat avastha then he has to have food in only in jaagrat avastha to remove that hunger. He cannot eat any dream-food to remove his jaagrat-hunger. Similarly, swapna prapancha objects have their utility in the swapna avastha only. If a person is hungry in the dream, then he quenches that hunger by eating food in the dream; during the dream, eating of jaagrat avastha food is of no avail to him. Q4: The swapna avastha is experienced only inside the physical body. Therefore definitely swapna prapancha is mithya because the dream-world is extremely large and cannot be held within this physical body. However the jaagrat prapancha is satyam, not mithya, because it is experienced outside the physical body. A4: Jaagrat prapancha is experienced as outside physical body only during jaagrat avastha, not during swapna avastha. In swapna avastha, the swapna-prapancha is experienced as being outside the body (in the dream). So your judgment of dream world is based on waking-state, however the judgment of your jaagrat-prapancha is based within the jaagrat-avastha itself. Therefore your evaluation has double standards within and cannot be considered correct. Q5a: You cannot claim that Jaagrat and Swapna are equivalent in terms of mithyatva. There is a difference between Jaagrat and Swapna avasthas. The difference is permanence. If today I am looking at a place in Jaagrat avastha, then that place continues to exist as it is for a long time. This is not the same in swapna avastha. One day a person can be dreaming about something, after waking up the contents of the dream or no longer there as they were in the dream. However the jaagrat avastha prior to sleep and after waking from sleep continues as it is. Even during sleep also it must be continuing as it is. However swapna prapancha is newly manifested every night as I dream. Therefore jaagrat avastha and swapna avastha cannot be equated as you say. Jaagrat prapancha is continuous and therefore is permanent and independent, and therefore it is satyam. Swapna prapancha is mithya for it is not continuous. A5a (this is perhaps the most difficult position that is countered by Mandukya Karika Bhaashya): Again the problem is that you are assessing the reality of the Jaagrat prapancha sitting in the jaagrat prapancha itself. This is not a fair position at all. To see this, suppose consider that the question – “Which prapancha is more real or permanent? Jaagrat prapancha or Swapna prapancha?” – is asked to the dreamed individual within swapna prapancha. He will definitely say that it is indeed Swapna prapancha which is most real and permanent (continuous) and there is nothing like jaagrat prapancha at all! During the time of experiencing either of the two, they both respectively appear real. Therefore one is not in a correct position to judge the reality of both Swapna and Jaagrat prapanchas. Individuals within swapna and jaagrat prapanchas are not capable of judging the reality of their own prapanchas. Q5b: Then what is to be taken as an impartial judge of the reality of jaagrat prapancha? A5b: We take the judge as the Vedanta Shaastra. Vedanta Shaastra (Upanishad) is the appropriate means of knowledge (Pramaana) to understand the reality of jaagrat as mithya (More on this, along with Step 2(b), in Part 3). Fantastic, though appears simplified, it needs repeated readings to grasp the core of explanation. . Thank you for the effort and contributions. ..